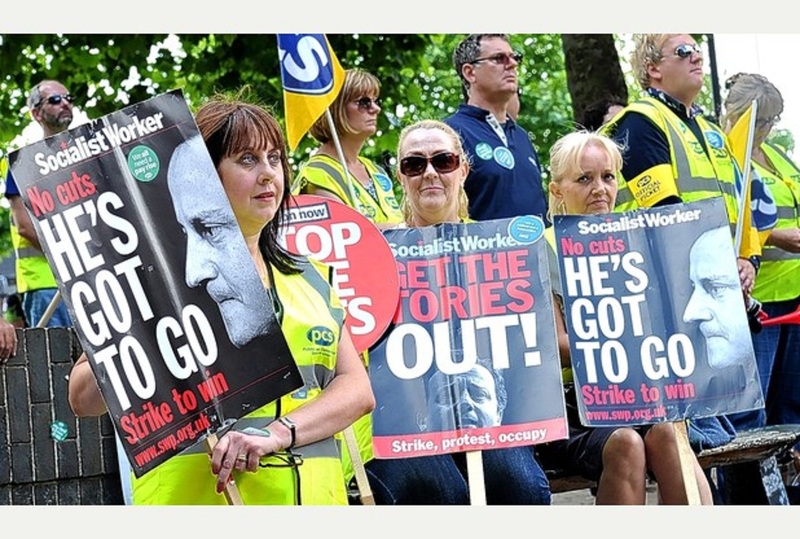 Protestors demonstrating against the bedroom tax. It is sometimes difficult to see beyond the rhetoric when politicians are arguing over issues such as welfare. Of course, it suits some people to paint the exchanges as a simple Tory versus Labour, blue versus red, rich versus poor battle. They would have you believe that the Conservative party – or Coalition government – is hell-bent on punishing the most vulnerable in society while protecting the well-off. 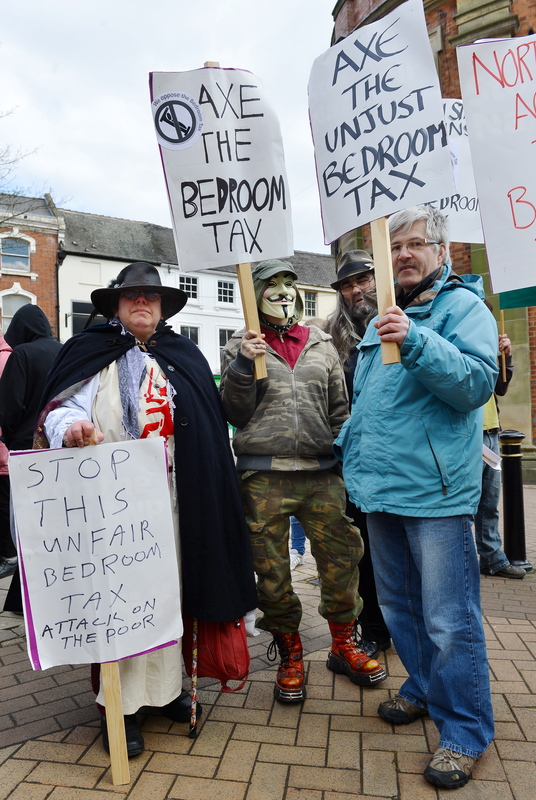 Initiatives such as the ‘bedroom tax’ – which sparked angry demonstrations in North Staffordshire this week – seem to support the claim that there is some sort of class war going on and you therefore have to choose a side. But if you look beyond the headlines and the soundbites you’ll see it isn’t quite so black and white. This week a raft of controversial changes to the benefits system come into force which include the nonsensical reduction to benefits for people in council or social housing if they have an empty bedroom in their homes. It’s a huge own-goal by the government which has the potential to seriously disadvantage a group of people who can’t afford to have their financial support reduced. There is also a benefits cap which will prevent any household receiving more than £26,000 a year from the state – a sum which is supposed to reflect the average gross salary of a full-time worker. The latter sounds fair enough in principle but it stands to reason that the occupants of every home should be assessed depending on their specific circumstances. Therein, of course, lies the problem with the welfare state. Blanket rules for everyone don’t work. They simply aren’t fair because everyone’s circumstances differ. The great shame is that the much-needed debate over the welfare state is being drowned out by the outcry against some changes which are clearly ill though-out. However you spin it, this country pays out hundreds of billions of pounds each year in benefits (a projected £216b in 2015/16) and it is a bill the UK simply can’t afford. Under the previous Labour government the welfare bill rose dramatically and it is only right that during these austere times, when everyone is having to tighten their belts, that the benefits system comes under scrutiny too. Last year I wrote about proposed changes to incapacity benefit – a controversial subject in an area like North Staffordshire which has higher than average numbers of people claiming the allowance. My column prompted criticism from all quarters, including letters from the local Citizen’s Advice Bureau and various claimants citing their own reasons for being absolutely deserving of the said benefit. My contention was a simple one: If you were genuinely unable to work through ill-health then surely you had nothing to fear from the new, albeit stricter tests, which the government was introducing. Now the results of the incapacity benefits review are known. Official figures show that 878,300 – more than a third of those who had been claiming benefit – decided not to take the tougher medical assessment to determine whether or not they were fit for work. Another 837,000 people were found to be fit to work immediately. A further 367,300 were assessed as being able to do some kind of work. Only 232,000 of the total number of people receiving incapacity benefit in this country were classified by doctors as being too ill to do any sort of job. This means that, according to doctors, seven out of eight people who had been receiving incapacity benefit could and should have been looking for employment rather than relying on hand-outs. One could argue that this demonstrates that during Labour’s time in office the welfare state masked the true unemployment figures by ‘hiding’ hundreds of thousands of people behind a fog of sickness benefit. I would simply say that while certain changes – i.e the ‘bedroom tax’ and cap on benefits per household – seem random, unfair and rushed, these figures clearly show that an overhaul of the welfare state was long overdue. The government may be wrong about some changes to the benefits system but there’s no denying the unpalatable truth that large numbers of people have been in receipt of benefits to which they shouldn’t have been entitled. Incapacity benefit is one example of a flawed, bloated system which incentivised not going to work. It wasn’t helpful to the individuals lulled into a life of dependency and cost the country an absolute fortune. Addressing this won’t solve all our economic woes but surely every little helps? Who is to blame for the city council’s debt mountain? They called it the ‘credit crunch’, didn’t they? A snappy little soundbite which attempted to explain to the masses that the bubble had finally burst and the Western world’s economy was going to hell in a handcart. Cue businesses going bump left, right and centre, horrific job losses, a housing market slump and a global financial crisis the like of which hasn’t been seen since the Great Depression of the 1930s. We can blame big city bankers for playing God all we want and, yes, they played their part. But the truth is that – for years – individuals, families, groups, businesses and even nations had been living on the never, never: Borrowing, taking out loans and living beyond their means. Then suddenly it was time to settle up and lots of people, many companies and even some countries simply couldn’t pay their debts. The pain of the credit crunch has lingered since 2008 and shows no sign of abating. Every aspect of our lives has been affected as a result of rising unemployment, the collapse of pension funds, the increased cost of living and the sweeping cutbacks in the public sector enforced by a Coalition Government desperate that we deal with our debt and don’t ‘do a Greece’. Caught up in this financial maelstrom, the NHS, the emergency services and local authorities are battling desperately to deliver vital public services with ever shrinking budgets. 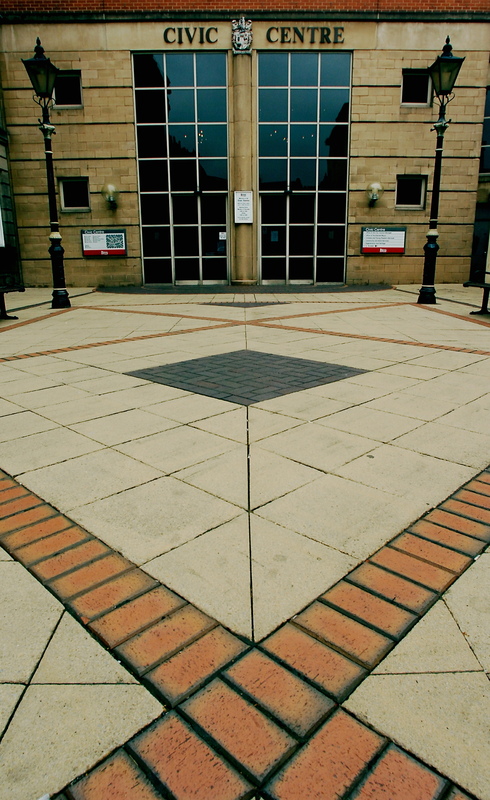 Local authorities like Stoke-on-Trent City Council which a few weeks ago confirmed cuts of £24 million on top of similar, city-wide belt-tightening amounting to savings of £35.6 million the previous year. The figures involved are truly mind-boggling. I guess once you get past the first £10 million it’s all just numbers, isn’t it? Unless, of course, those numbers meant you were one of the 300 people to lose their job with the council. Or you were one of the thousands who suffered as a result of the many cutbacks to services across the board. Well here we are, less than two months after those savings were announced it seems the city council is suffering a credit crisis all of its own making. New figures show the authority is owed a staggering £8.6 million. This debt mountain has accumulated from relatively minor bills which have gone unpaid by thousands of people. It covers all sorts of services from room hire, skip hire and licensing fees through to commercial rent, market stall rent and even rubbish collection. Yes, that’s right. The city council, which has been forced to make people redundant and make cutbacks on everything from allotments to swimming pool subsidies should be millions of pounds better off than it actually is. Now I could understand an organisation the size and scope of a unitary local authority being owed substantial sums of money. Maybe several hundred thousand pounds. But £8.6 million in unpaid bills because the council allowed people to use services without settling the bill until a later date is beyond a joke. One of the key reasons businesses go bump is because of cash-flow problems. In other words, they fail to get what is owed to them quickly enough. 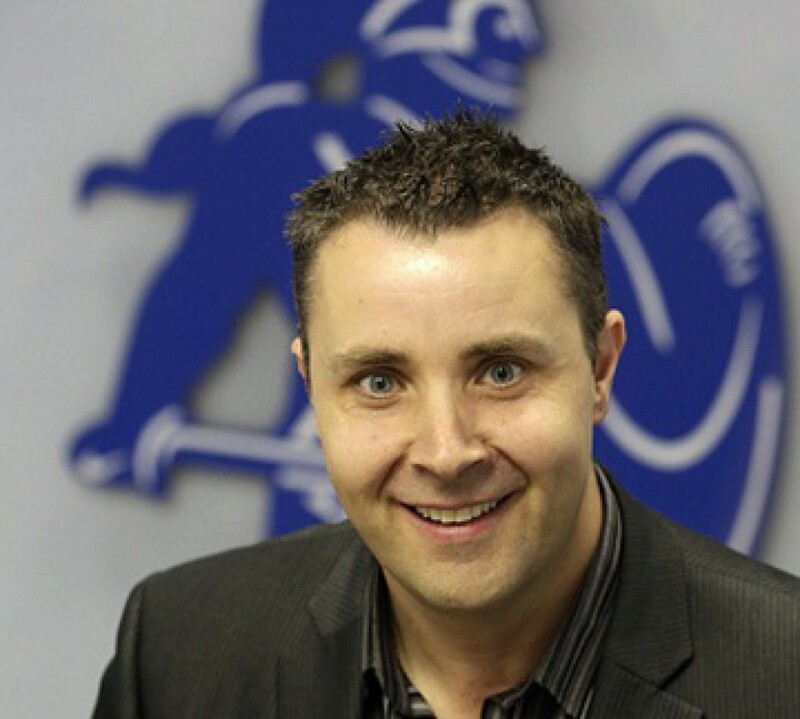 Councils don’t generally go bump – they just share the pain – which is exactly what has happened here in the Potteries. We are told that new policies have now been introduced to avoid such problems in the future but, in all likelihood, the authority will end up writing-off the bulk of this debt and so questions surely remain. Questions like: Why was the debt mountain allowed to accumulate in the first place? How come no-one saw this coming? Which officers are at fault, here? Why weren’t there procedures put in place long ago to avoid such a fiasco? It wasn’t so long ago that the powers-that-be at the city council were considering doing away with the vital role of Lord Mayor to save just tens of thousands of pounds. Meanwhile, there has – understandably – been much gnashing of teeth over the cost to taxpayers of the Port Vale bail-out which was crucial to the Mother Town of Burslem. The fact is if the authority had had procedures in place to collect in some of the millions of pounds it was owed this year’s cutbacks would surely not have had to be so harsh, so painful and so wide-ranging in the first place. I beg to differ, Sarah. Just because the horse has bolted doesn’t mean you can’t examine the stable door to find out how it got out in the first place.